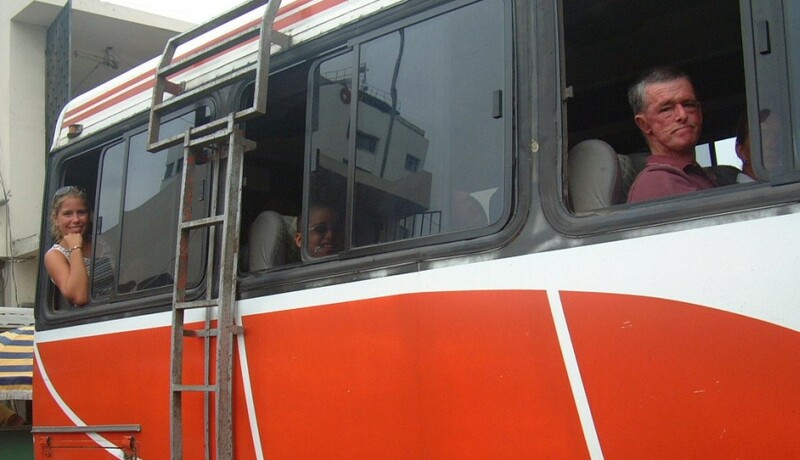 On April 6, 2003, we left our boat (and the cat, Arthur) at anchor in Manta, and headed inland by public bus. We traveled with the family from Vamp, an Australian boat, who are finishing a 4-year circumnavigation. They also have 2 kids, 12 & 14, so we were 8 people - quite a crowd. This made an excellent bargaining point when we went to hotels, since many of them had no other guests. Click on the map to see a detailed route map, both political and physical. Buses: Being money-conscious adventuring yachties, we chose to travel by bus because of the great bargains: about 1$ per hour of travel. The price seemed to be the same whether on luxury (air-conditioned) monsters or local (rattle-trap) clunkers. We avoided the A/C buses, because the windows stay closed, the whole front of the bus is closed off by door and curtains so you can't see forward, and there are lousy less-than 3rd rate movies playing loudly all day. We found the best buses were one step down from the "luxury" busses. These had comfortable, tilt-back seats right by the driver, so we could see out, and opening windows for air & photos. Tickets were always sold on a seat-reservation system (not always enforced), starting at the front of the bus. When we arrived in Guayquil from Manta, for example, we bought tickets not on the next bus to leave, but the one a half-hour later, so that we could get the front seats. The 4 teenagers, of course, usually opted for the far back seats so they could have leg room and bounce around a lot away from parental interference. 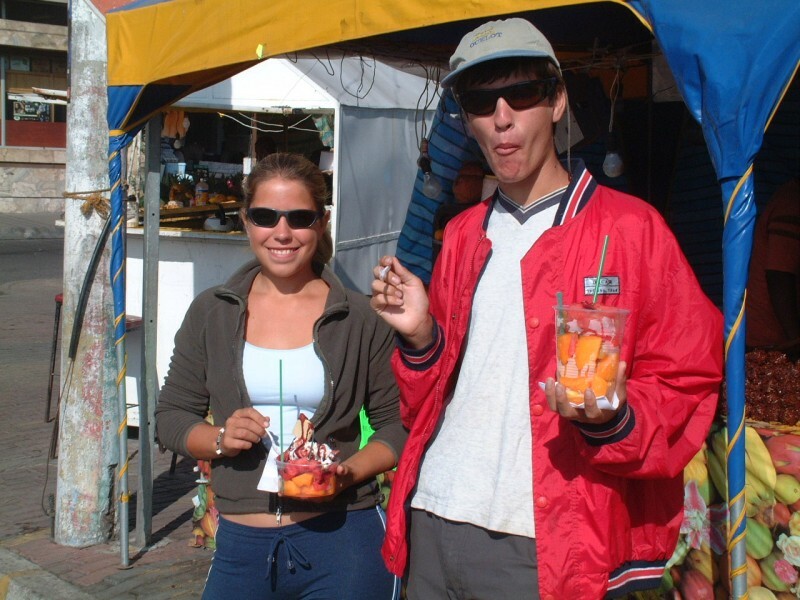 Bus stops at fruit stalls were great. 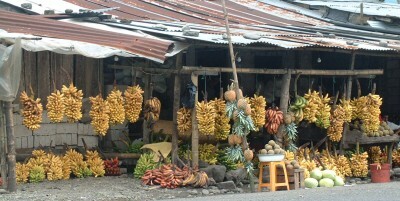 Ecuador is S. America's #1 banana exporter! (Jon) For our tour, we decided to take a counter-clockwise trip up the spine of the Ecuadorian Andes. 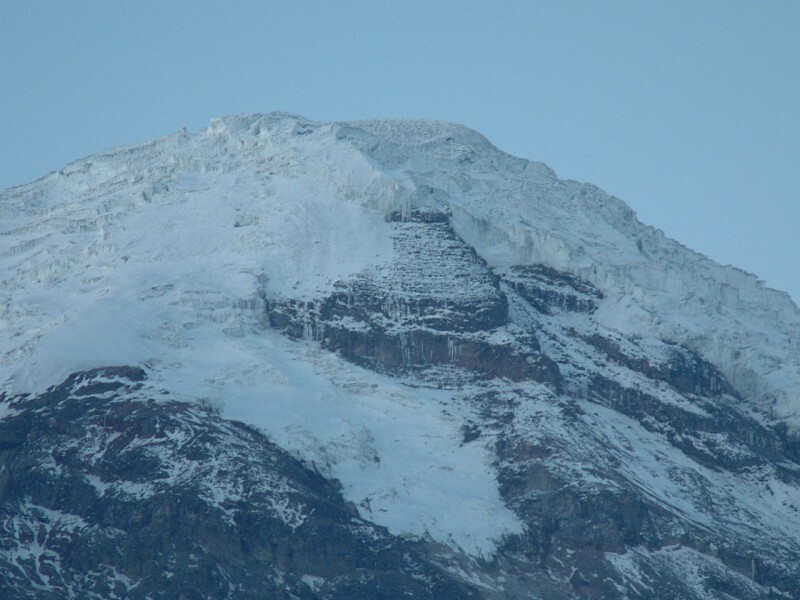 Our first day was mainly just getting to the mountains and involved about 8 hours of bus rides, first to Guayaquil (a large, dirty and eminently forgettable city) and then to Riobamba. 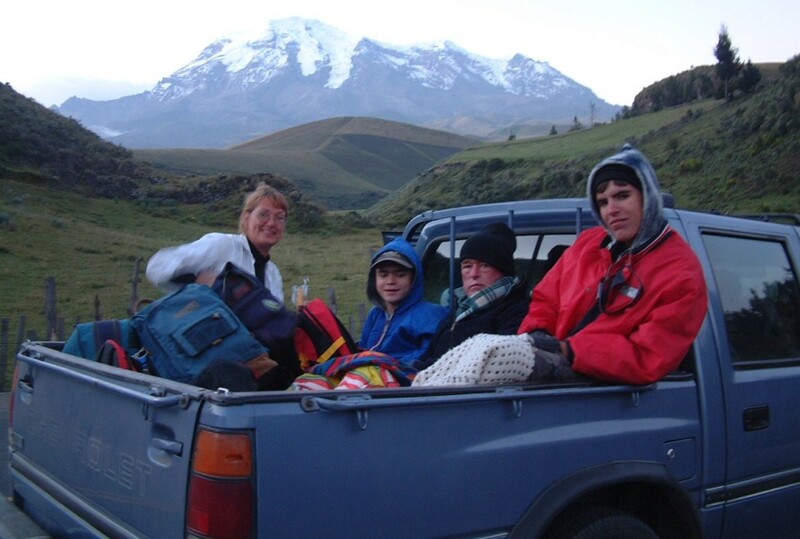 After a morning exploring Riobamba we took a taxi (well, a twin-cab pickup, with the kids in the back, which they loved) up to the Chimborazo volcano, and then on to Baños. We stayed in Baños 2 nights, renting bicycles to ride down a gorge and then hiking above the town. Our next bus took us to Latacunga, which looked a bit skuzzy near the bus stop, but got much quainter as we approached our hotel near the central plaza. While Latacunga didn't offer us much more than pleasant strolls around the town and an excellent dinner, it's right next to the town of Saquisili, which, on Thursdays, hosts the biggest local market in Ecuador. Andean people from miles around come there to buy and sell, so we went there to be a part of it and watch the action. I think some 8 plazas were filled with stalls, as well as many of the streets. We only stayed half a day, but if we'd stayed any longer we wouldn't have been able to carry everything back to the boat! So that afternoon we caught the bus up to Quito, where we walked around the old part of town (the rest of Quito didn't look that inviting). The next day we took the 8+ hour bus trip back to Manta. The trip down the pass would have been great except that our bus driver wanted to be the fastest vehicle on the road. If he saw another vehicle, he tried to pass it. This made for a rather hair-raising 3 hours, as we were sitting in the front of the bus, and the road was steep and very windy. There were actually 2 drivers, and they traded off. The second one was much mellower, so I tipped him, and let him know why. Unfortunately, I couldn't arrange to do it in front of the maniac driver. 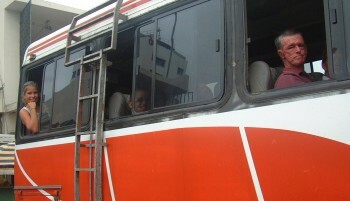 A funny thing happened in the Guayaquil bus station. Since the busses don't have bathrooms, Chris and I took the opportunity to use the men's room in the station. We each chose a stall for privacy rather than using the open urinals, but a maintenance attendant noticed Chris was standing rather than sitting, and he tried to open the door to the stall. When I came out and explained that the stall was occupied, he only got more agitated, and ran out the door. When he returned, it was with a local security guard(! ), who wanted to arrest Chris for (presumably) inappropriate peeing! I'm not making this up! I took over the argument in my pidgin Spanish and, not the least intimidated, told the guard that if he wanted to talk to us, he'd have to come with us, because we had a bus to catch. He straggled along for about 50 yards before realizing just how silly he looked and letting us go. I think my favorite part of the trip was Saquisili and the market. There were so many amazing things to see and buy, like the woman selling a rack of over 30 roasted pigs heads (I'm not making this up). Such a bargain at only $4 each! As it was, we bought cloth purses, an Andean musical pipe, jewelry (Amanda had a birthday coming up), and I got a wonderfully soft Alpaca jacket for only $8. I could have stayed longer in the mountains. We don't get to see enough of them from the boat. 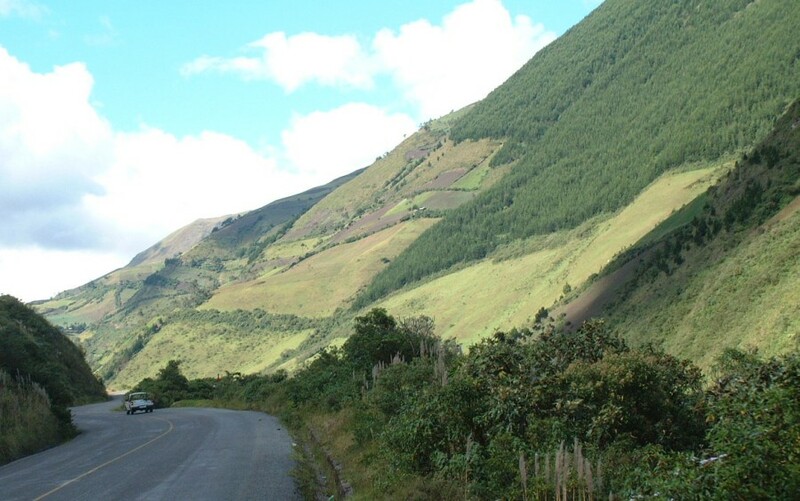 The traveling is cheap, the food is good, the scenery is beautiful, and the Andean people are delightful. But Vamp wanted to get back to their boat and I had some repairs to do before I wanted to sail, so we bid farewell to the mountains and headed back home as well. (Sue) This was a GREAT adventure! The scenery was fascinating, starting with the low, dry hills south of Manta, towards Guayaquil, then becoming lusher and more dramatic as we ascended into the highlands. 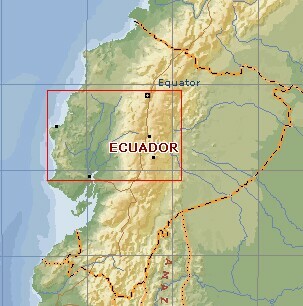 With the handy Lonely Planet Guide to Ecuador, we chose our destinations for activity possibilities and scenery. We located clean, cheap accommodation every night, usually bargaining the rooms down to a comfortable $4 or $5 per night per person. Sometimes that included breakfast of eggs, toast, jams (Andean blackberry), fruit, and coffee. Now go figure: Ecuador grows coffee, but invariably when they serve it what you get is a cup of hot milk, a bowl of sugar, and a jar of Nescafe Instant coffee. Eating out was no economic drain -- not at $1.50 for a 3-course set menu lunch or dinner, to an extravagant $4 for a really nice steak diner at a fancy restaurant. Fresh fruit salads for breakfast in Riobamba! The town of Riobamba was just a stop-over on our way north through the Andes but it had an interesting mural, a local artisan who carved tagua nuts (a rainforest-renewable resource), and a street-packing peace march with the local school kids. From Riobamba we took a jeep ride onto the slopes of Volcán Chimorazo, the highest peak in Ecuador at 6310 meters (20,702 feet). (As a trivia note, its summit is also the farthest point from the center of the earth, due to the earth's equatorial bulge). 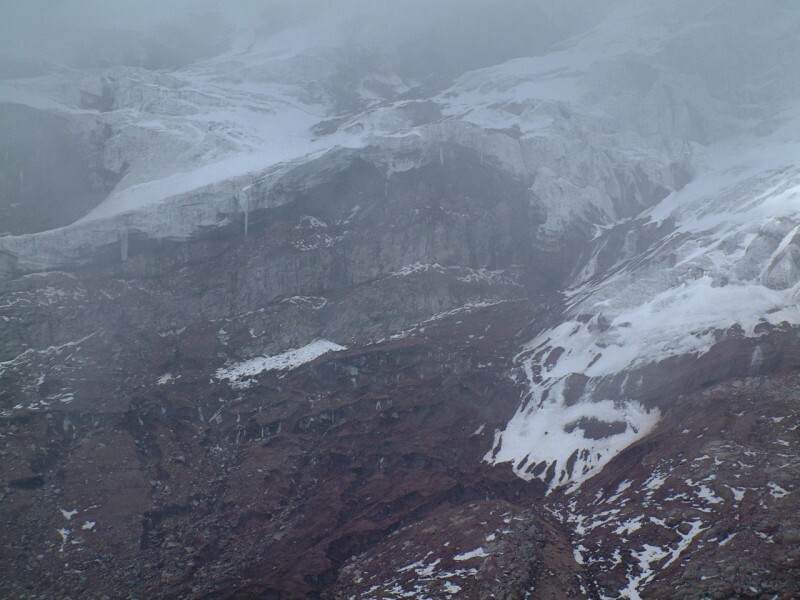 We drove to over 15,000 feet, then hiked (slogged) up another 1000 feet to touch snow (well, packed ice), and drink hot chocolate at the climber's refuge. 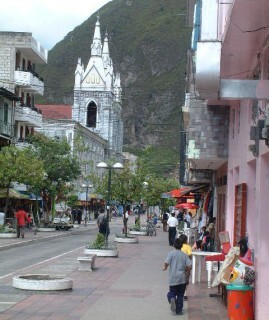 My favorite place was Baños, even though it is a bit touristy. I guess it's cause we were able to hike and mountain bike and really be outdoors. The town is small enough to walk from end to end, or should I say from gorge to gorge, under a smoking volcano that sent all the inhabitants running in 1999. (Chris age 16) Wow ... that basically covers everything. One of the things that I noticed the most is that I was possibly the tallest person in the country. I certainly always seemed to be the tallest one in sight, and most of the locals didn't even come to my shoulder. The downside of this is that everything is designed for short people. This includes the bus seats, hotel beds, and even where on the wall the mirrors are positioned! Another thing about inland Ecuador was that there was always lots of food available, and it was always cheap. Candy, ice cream, and snow cones were everywhere, fresh fruit (apples, bananas, oranges, papayas, grapes, strawberries, and many others) were being sold by the basketful, and hot, savory snacks like fried corn, plantain, or patties made with cornmeal, onion, and cheese were always available for absurdly cheap amounts. Small restaurants and food stalls seemed at least as common, selling everything from rice and beans to steak dinners and roast chickens. Most places would offer several things, but the cheapest and fastest was usually a set meal; consisting of some kind of soup, rice, and some meat (usually chicken, beef, lamb, pork, or fish, though some places also had some odd things, like guinea pig.) For example, on the morning of my dad's birthday, we walked around town for a few minutes and picked up pastries, cups of fresh fruit, and big plates of beef stew over rice, all for less than breakfast at a restaurant in the US. Getting up onto the volcano was a lot of fun too, though I wouldn't have minded a little less rain while I was in the back of the pickup. The hike was also very hard for somebody who is used to sea level and has not had enough time to acclimatize, but I think it was worth it. The mountain was gorgeous, and we saw a lot of the Andes and Andean wildlife on the way up. The landscape was not as much hills-and-valleys as Venezuela, though there were still several deep ravines with rivers at their bottoms. The soil seemed more rocky, with less clay, and probably did not erode as easily. 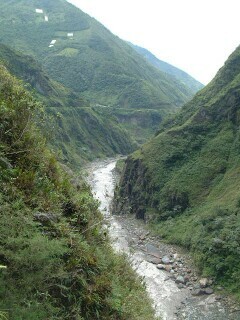 The part of the trip that I liked the most was definitely the bike ride from Baños. 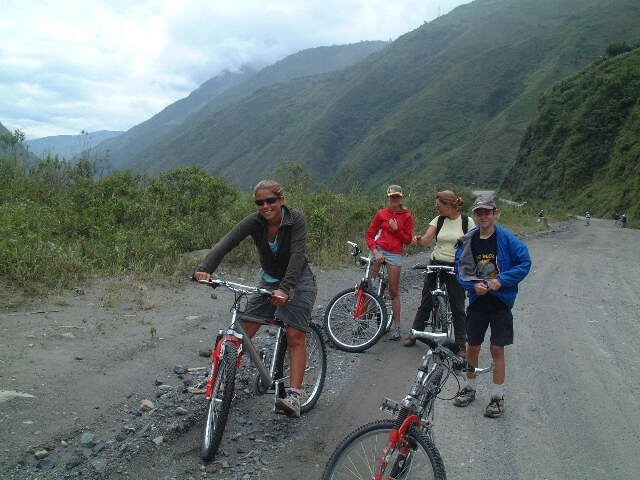 Biking is one of the things I most miss from home, and the ride in Baños was undoubtedly one of the nicest I have ever taken. I was somewhat displeased at first by the quality of my bike (or rather, its poor state of repair) but that was soon completely lost in the joy of the ride. The views along the valleys were breathtaking, and the path itself was delightful. It mainly paralleled the road, but there were many places to stop and look around, and at one spot, we got off our bikes and walked down across a suspension bridge to a waterfall. Most of the ride was downhill, and when it started to rain, we waited under a shelter until a bus picked us up. (Amanda age 13) I'm the last one to write on this page, so that makes it a bit difficult for me. What else is there to write? The landscape of inland Ecuador was exquisitely beautiful. Lush and green, it was wonderful to see it after dry and dusty Manta. 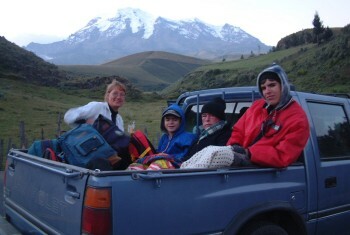 When we took the truck trip up to Chimborazo, Rachel and I joked on how we would live up in the green hills and work as photographers. It felt nice to be cold again, also, though after a while I decided I had had enough, and sat in the cab of the pickup, instead of on the back. The market in Saquisili was fascinating. Unlike most of the markets we've seen, this one was mainly for the locals, and that meant not much touristy stuff. It did feel a bit weird to see all the animals being sold, right next to the food, including roasted pig's heads. I could just imagine one of the live ones looking up and thinking Oh, that's where Harry went to! As well as livestock, there was also food, mechanical appliances, ropes, and, yes, a bit of jewelry and weaving and things generally thought of as touristy. This market is only held once a week, so everyone was there, and you could get almost anything you could possibly want. I wish we could have stayed longer inland, possibly doing something like we did in Venezuela, but unlike when we were in Venezuela, we had a slight deadline to get through the South Pacific, and that meant no dawdling. We knew that if we stayed longer than Vamp, who wanted to get things done on their boat, we probably would have spent another week or two up there, and then they'd be even further ahead of us than they are now.